I went to St. Louis the first weekend of November for the Navigators’ National Staff Conference. I spent the second weekend of November in Gainesville at the Florida Navigators’ men’s retreat. It sort of seems like we just had one of these. The last two of these have been during the spring semester. This time it’s in the fall since we’re moving our big conference back to the spring. Anyway, this was your typical men’s retreat, complete with lots of food, man challenges, and good speakers. We heard from Andy Farina on Friday night and from Dave Wirgau on Saturday morning. Saturday afternoon was a panel discussion where students were able to ask the “senior staff” their questions. The goal of a weekend like this is to remind our students (or in some cases, introduce the notion for the first time) what it means to be a man of God. Beyond the fact that the trip was spiritually encouraging the games were also a lot of fun. I stayed up all Friday night playing Risk. (Me and my partner were down to one man in Argentina but came back to take over the world.) The man challenges that I mentioned included a banana eating contest (which I videoed) and a minivan push. When it was all said and done UF won the man challenge and brought the trophy home to Gainesville. Will get them next year. Earlier this month I had the opportunity to travel out to St. Louis for The Navigators National Staff Conference. They only have one of these once every four years, so I really lucked out that my first year on staff happened to coincide with this event. There were around 1200 Navigator staff at the event each day at the Millennium Hotel. I had the privilege of hearing a lot of fantastic speakers such as Eddie Broussard, Brenda Salter-McNeil, and Bill Tell. We also got to hear a talk given by Alan Andrews, the U.S. Director, and Mike Treneer, the International President. I have pages and pages of notes from these talks that I haven’t had the time to properly digest. I thought since many of the FSU Navigators ministry stories I write this year will include my teammates it’d be good to toss up a staff team photo. This was taken last night in Kellum Hall, one of the freshmen dorms on campus, as we hosted a football party in the main lounge. Luke and Kyle are my roommates. Alyssa, Nicki and Helen are my next-door neighbors. 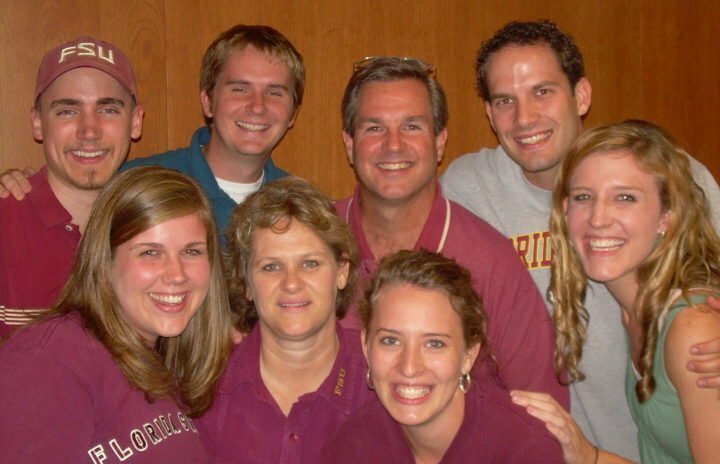 Dave and Martha are the staff couple who have been ministering at FSU for over 20 years. I’m Joining the FSU Navigators Staff Team! I’ve decided to make a change in my life. Starting in August I will be joining the FSU Navigators staff team as a part-time staff member! This has not been an easy decision to make and I’d like to take you through the journey.